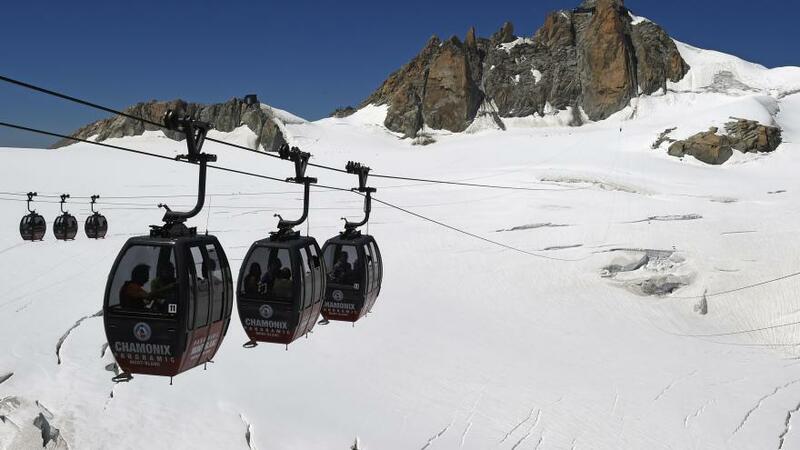 The night was probably long for thirty-three people, including a child of 10 years old – blocked since Thursday afternoon in the cable car broken down over the glaciers of Mont Blanc, at over 3000 meters altitude. The cable car cabins have been handed on and also these passengers will join the mainland without being airlifted. It was a ropes’ crossover happened “for reasons unexplained”, but probably due to a gust of wind, which blocked the cable car built in the 1950s, according to Dechavanne Mathieu, CEO of the company Mont Blanc. The company’s employees failing to uncross ropes, so an evacuation operation began around 17:00. Seventy-seven others, who were also trapped, were evacuated on Thursday: 48 winched by helicopters and thirty, located in cabins closest to the ground, which were lowered by the help of rescuers. Also other twelve people were evacuated into the night by Italian rescue workers, as said by the prefect. Four helicopters, French and Italian, had been mobilized for the helicopter evacuation operation commanded by the high mountain police squad (PGHM) of Chamonix. Five rescuers, three French gendarmes and two Italians were sent to help tourists during the night. A policeman was notably placed in a cabin that houses a child of ten years old. Stranded tourists also have survival blankets, energy bars and bottles of water. However, rescuers were unable to take a position in two clusters of three cable cars which thus find themselves “orphan”, in the words of the prefect. People rescued by helicopters during Thursday night were sent to Helbronner on the Italian side of Mont Blanc before being brought back to Chamonix or elsewhere. “The last hour was very, very long. We called the company (Mont Blanc, ed) who explained that three cables were tangled, but they have not succeeded” told a tourist rescued on radio France Bleu Pays de Savoie. Up there, “trying to evacuate, but it is very difficult. I had to close my eyes for a while to try to move on” he added. The cable car “Panoramic Mont-Blanc” overlooks the glaciers of the Vallée Blanche and can cross the Mont-Blanc from France to Italy. An operational command post was set up in Chamonix, under the command of High Mountain Gendarmerie platoon (PGHM). The Prefect went on site “to direct the rescue,” he said, referring to a “large scale operation”.